On my trip to the Scrappy Scrapper in Waxahachie last week-end, I found this funky dec paper by Sassafras Vintage Yummy Blossomed and knew it would be perfect combined with MFT's Funky Flowers by Sara Williams (I am her proud Mom). 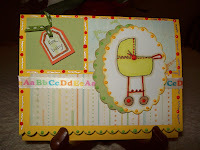 I used Stampin Up's More Mustard as the base of the card with the image stamped white and layered with orange and Creamy Caramel and Black. 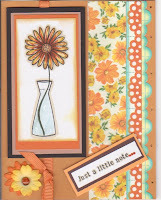 The sentiment is a stamp by AMuse and also layered and set up on dimensionals along with the flower image. 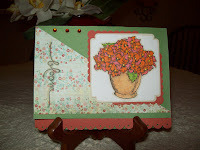 The flowers in the corner are Flora Doodles and were ideal with all the colors on the card. Thank you for stopping by -- come back again! 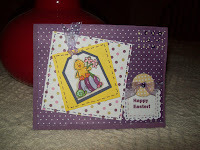 This is the first card I've done after getting in my Nite Nite Ellie set from MFT. I had the extreme pleasure of meeting little Miss Ellie at dinner one night with her mom, Jen DelMuro, and what a smart little sweetheart she is. 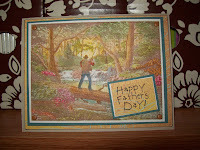 I thought about her the entire time I was doing this card. Although she does not have brown hair, I did this for my granddaughter who (with the exception of one) all have brown hair. 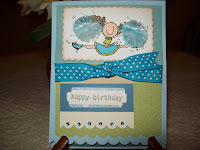 The stripped decorative paper that I used were included as a freebie from MFT. 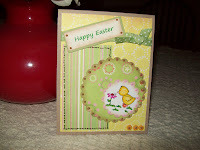 The CS is from PaperTrey along with the matching Tiny Dot paper I pieced together for Ellie's pj's. I like the way this turned out. 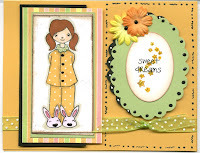 I must tell you a story, though, When I first made the card and used 3-D paint for the buttons on the pj's and the noses on the bunny slippers, I went to grab the image (all put together and all layered), I smeared the 3-D paint!! It made me so made, I turned off the light and immediately just went to bed. Not until the next day did I have the inspiration to do the image all over again and went ahead and adhered it to the "smeared" one leaving the layering in tack. 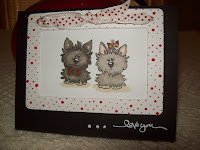 Anyway, it's all fixed and ready to sent out!! 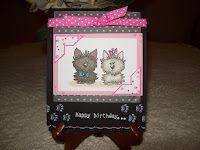 Cardstock: Papertrey solid and matching Itty Bitty polka dots plus White CS; Stampin Up Certainly Celery and Basic Black; MFT Striped cecorattive paper.